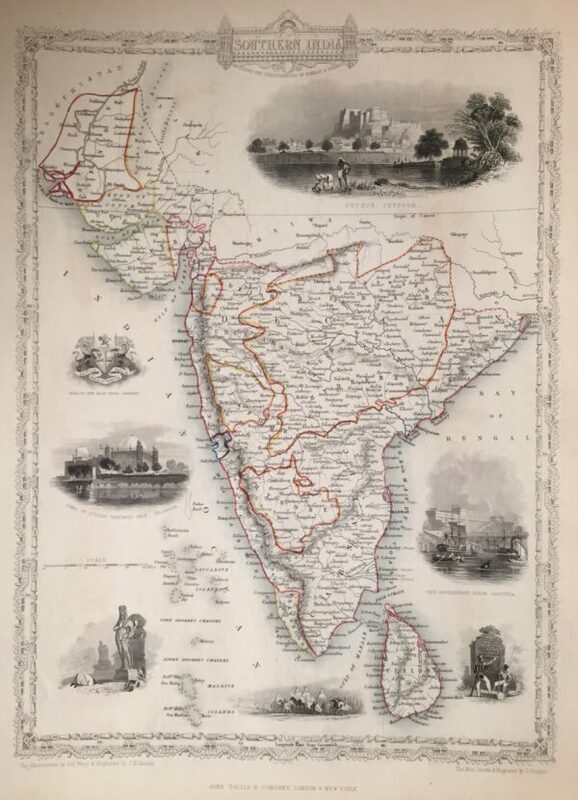 Finely engraved mid 19th century antique map Southern India by Tallis, which was drawn and engraved by John Rapkin (H. Warren & J. Rogers) and published in John Tallis & co.’s The Illustrated Atlas (London & New York: c.1851). This is an earlier version of the Tallis map (possibly proof) which is without the vignette of ‘Circular Head’ and has a different view of Hobart. The Illustrated Atlas, published from 1849 to 1853, was the last decorative world atlas. The ‘Van Diemen’s Island’ map was typical of the many fine ones which appeared in this work with its ornamental border and attractive vignettes.